While watching the Super Tuesday results, numismatists were treated to a new potential collectible: the Idaho Caucus Coin. The Idaho Caucus Coin, part of a new process this year, was used during the caucus in Boise, Idaho. Caucus goers were given a specially made coin to drop it in a closed canister for the candidate of their choosing. When the voting ended, the coins were “counted” by weighing them. If the caucus judges felt that the weight was wrong, they could request the coins be counted. First they would be counted by machine and, if that was not satisfactory, the coins would be counted by hand. There have been no reports that counting was requested. 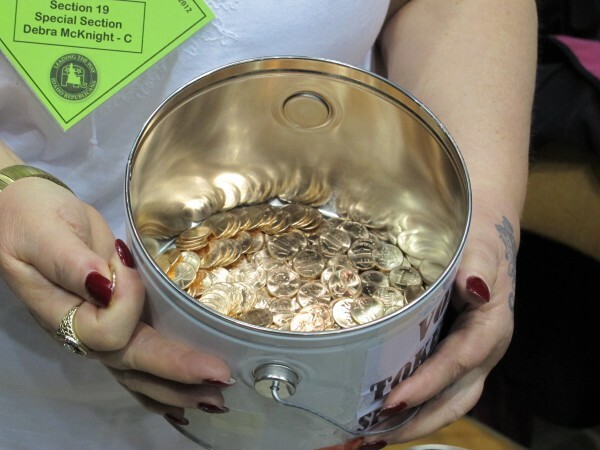 During the caucus, if no candidate received more than 50-percent of the coins, those receiving less than 10-percent were dropped from the next round or the candidate with the lowest total would be dropped. This process would continue until one candidate received more 50-percent of the coins. During a live report on CNN, the reporter showed a specially made coin for the event that was copper in color. Although CNN did not focus on the coin, it looked similar in size to the U.S. One Cent coin. CNN did not comment on the composition or the design of the coin used. A query has been sent to the Canyon County Republican Party asking about purchasing the coin. This post will be updated when someone provides information. Image courtesy of Boise State Public Radio.